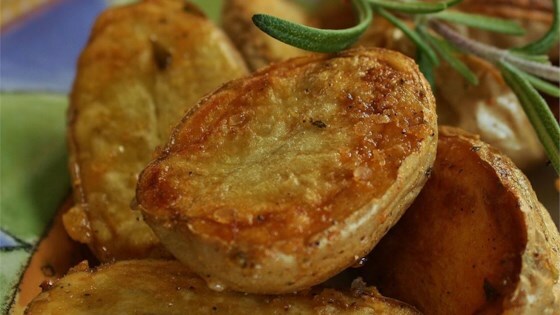 "Delicious and crispy potatoes that smell wonderful. Great for any occasion and super easy!" Mix potatoes, olive oil, Parmesan cheese, and rosemary in a bowl. Season with salt and pepper. Spread potato mixture over prepared baking sheet. Bake in preheated oven until potatoes are golden brown and tender, stirring once, about 40 minutes. Fairly common method of preparing roasted potatoes but delicious nonetheless - and the directions work. However, for best and even browning, turn half way through the cooking time. KEEPER! What isn't to love - double the recipe, everyone is going to love them. Very tasty and super easy. I boiled the potatoes for about 10 minutes before baking them to accelerate cooking time. Baked them for about 20 mins or unti golden. Awesome recipe! I almost ate the aluminum foil I cooked it on!